If you are searching for a Yoga Teacher Training Program where you will receive full support, expert instruction, and lasting inspiration, Halifax Yoga is the place for you. In our 7 month program you will find a safe space to step to your own edge and emerge open-hearted, radiant with confidence, brimming with possibility, and READY to teach safely, effectively and with integrity! We believe Yoga is for everyone and our program makes yoga accessible to people of all ages and ability levels. We work on all levels of the body, mind and spirit, not only improving strength and flexibility but rejuvenating the whole being. The Halifax Yoga 200-hour teacher training is focused on Vinyasa Flow and Baptiste Inspired Power Flow, which combines the flow and power of Ashtanga with the meticulous alignment and sequencing of Iyengar yoga. You will receive a thorough understanding in asana, alignment, anatomy, hands on assisting, sequencing and philosophy, as well as take forays into the subtle body, prenatal yoga, Yin Yoga, Meditation and Pranayama. Get ready to be transformed! Is my yoga practice advanced enough to do a yoga teacher training? We have had students with very little experience, but it’s best to have a regular yoga practice. You do not need a certain level of physical ability. For example, many yoga teachers cannot do handstand and they teach excellent classes! Yoga Teacher Training will radically change your practice and you will see amazing changes. A regular yoga practice, a desire to learn and an open mind is all you need to participate in training. How much movement is there going to be? Our teacher training is a mix of both practice and philosophy/theory ; so you will move and sit! In a balanced training you will cover philosophy, theory, and anatomy, which require of sitting and listening, but you will also do a lot of personal practice, hands-on assists, sequencing, teaching and posture clinics, which are much more physical. Why do a program with my studio? A question to ask yourself is if a solid relationship is important to you. If you’re looking for someone to guide you, mentor you, ask for advice, be in the community you have grown in, training at your studio is important. It is also important to take training where you want to plant your roots if you do not already have a community. If you want to cultivate teaching opportunities, it’s best to practice with someone who knows the community and network you’d be trying to work in and guide you in the right direction. Does my yoga teacher training need to be Yoga Alliance registered? Yoga Alliance is an organization that provides regulation to Registered Yoga Schools (RYS) and Registered Yoga Teachers (RYTs). To register a teacher training, the school submits an overview of their curriculum, along with annual fees, to demonstrate that it meets Yoga Alliance’s standards for curriculum content and study hours. Halifax Yoga is a registered Yoga School with Yoga Alliance for 200 and 300 hour training programs. This allows you to be able to teach all over the world and allows ease knowing we are an approved curriculum! Is this training only relevant to people who want to teach? NO! Yoga teacher training is about your hopes, dreams, goals, ethics, and plans? How do you want to live, what do you want to change? Yoga training aids with the big questions and it offers tools and skills to help you show up in a more confident, peaceful way in your life. Hours and Make up Time? We want our students to try to be there 100% of the time, but we know life happens! We make this program super accessible to everyone with families, work, and other obligations. ONLY 1 WEEKEND A MONTH!!! If you miss time, we will support you, so you can get caught up. We allow make up time that is realistic and do-able! Is there a RIGHT time to do Teacher Training? Honestly, No. Life is busy and something always comes up. The right time, is the time you take a leap and become open to the possibilities that surround you. Be the Change! Will I be able to get a Job after I Graduate? In our program you will find a safe space to step to your own edge, radiant with confidence, brimming with possibility, and fully prepared to teach! There is on-going post-graduation support for job placement and further learning. We offer Internship, Outreach, Corporate Yoga, and even in-house opportunities! We have an amazing faculty of teachers and assistants with decades of study under their belts. They are honoured to share their vast knowledge of anatomy & physiology, philosophy, and specific areas of expertise which allow you to have solid program with all the tools to build your yoga career. Sherry Zak is the founder and owner of Halifax Yoga. She has developed a devoted following because of her honest teaching style and a deep understanding of the physical and energetic body. Her lively classes bring a fresh awareness to timeless principles of skeletal alignment and muscular engagement that builds strength and fluidity. Her career as a Registered Massage Therapist influence her love for teaching ‘Hands-On Adjustments for Yoga Asana’ which will be an integral part of the training. Sherry’s compassion and willingness to hold space for growth has made her an accessible mentor and friend to the hundreds of yogi’s who come through the doors of Halifax Yoga. I LOVE yoga! I grew up watching my dad practice Kundalini yoga and doing headstands. As you can imagine, being a teenager, this was fully embarrassing when I’d have friends over and he would have them try out a Kundalini move! My own personal love for yoga began when I realized the physical changes which impacted my mind. This transformation happened slowly but I started to notice that my Yoga practice provided the grounding and stability I had been seeking. 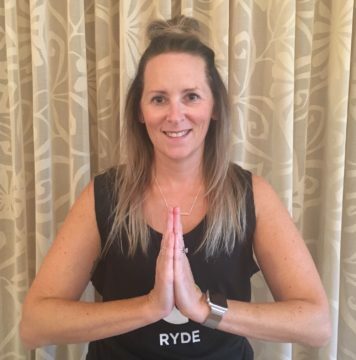 I have been teaching Yoga and RealRyder Indoor Cycling at Halifax Yoga for 8 years and have assisted & mentored the Yoga Teacher Training Program for almost as long! I’m also passionate about facilitating the 40 Days to Personal Revolution Program as well as ongoing trainings and workshops. When not at Halifax Yoga, you can find me teaching elementary school and children or with my loves – my beloved dog, Yogi, and my beloved husband, Paul. In my class teaching, you can expect to experience challenge, choice, space, accessibility and fun! I believe in the power of this community and the connection between all of us! This is my work in the world ~ being of service to others and what an amazing journey it is! My dharma is “I breath life into the world and raise the vibration for all.” What’s yours? Tracy has committed her life to the study of the human body. She is an Osteopathic Manual Practitioner with a B. Sc. (Hons) in Osteopathy. Please note that Tracy does not practice Osteopathic Medicine (she is not a physician). She practices Osteopathic Manual Therapy at Well Within Osteopathy in Halifax. She also holds a Bachelor of Physical Education, and is a Massage Therapist. She completed her certification as a yoga instructor over 15 years ago. Tracy has been part of the Halifax Yoga instructor team since the first yoga teacher training program offered at H.Y. and continues to facilitate the Anatomy portion of the Yoga Teacher Training courses. She is an instructor for the Canadian College of Osteopathy where the courses she leads include lumbar spine (low back), bones of the face, and upper limb (shoulder, arm, wrists). Cost $3700 ( plus taxes). 1 Time Payment $3700 (plus tax) EARLY BIRD Until May 1st! $3200! 1 Year Membership 50% off with Early Bird YTT! *Full Deposit is refundable until July 1st. 50% Deposit refundable until Aug 1st. Once YTT starts deposit is non-refundable. The tuition is non-refundable and non-transferable. *Theses are preliminary dates for our 2019/20 program and may be subject to change.